Inspired by characters from the epic anime series Naruto. This red and black pattern symbolize their special powers. If you are a Naruto series fan, then these contact lenses are perfect for you. 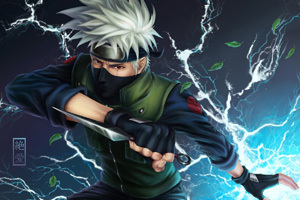 They are named after one of the series' characters, Kakashi and they will make your eyes look just like his. Red and black colouring of the lens provide a freaky effect on the eyes and will definitely not go unspotted. Try them now and become your favourite character in no time!